Workforce Management doesn’t have to overwhelm the daily duties of workforce administrators.. A web based system can cut down on administrative costs significantly while allowing your organization to scale and manage workforce effectively. 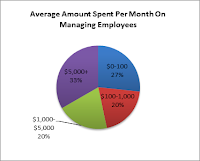 Based on the recent survey conducted on LinkedIn by a business club in Chicago, 33% of companies spend more than $5,000 per month to manage their employees. 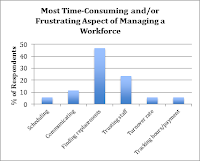 Also, finding replacements for the last minute cancellation or no show is considered as one of the most time-consuming and/or frustrating aspect of managing a workforce. There are 8 different ways you can manage your workforce effectively and efficiently. 1. Allow your staff to access and update their own information. 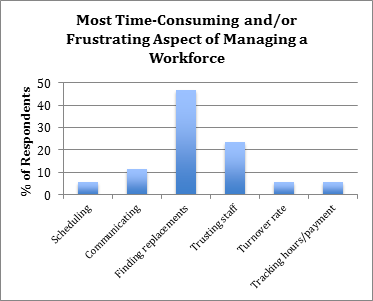 The data entry and consistent updating of staff information can cost managers valuable time. By using an online self-service portal, your workforce can update their own contact information, skills, licenses, credentials, education and work history information. This can become quite valuable as you are matching candidates to opportunities. 2. Know staff location, skill and availability. The three most valuable facts to know about staff are where the employee is located, what skills they offer and whether or not they are available for work. By utilizing a system which contains such information about each employee you can streamline the process of finding the best employee for each job request. 3. Manage client job orders efficiently. At any given time a company may have dozens of job requirements which need placements. A real-time dashboard indicating confirmed and open jobs as well as quickly identifying who is working where is very critical. 4. Automate job alerts and reminders. People do forget their work schedule especially for short term jobs. Reminders are very important. Automated reminders keep your staff on track and clients happy with least amount of work. 5. Integrated time keeping and payroll. With a web based workforce management solution, your time spent calculating actual hours by your staff and processing payroll may be a thing of the past. Allow staff member to submit their hours online and integrate information with your payroll after review and approval. 6. Give staff access to their work schedule. Every temporary staffing recruiter has dealt with the nightmare of a staff member who was confused about the specifics of the job and didn’t show up. Once the damage is done the client needs a replacement and the employee is not likely to be considered for future opportunities. By allowing each staff access to their own schedules and the ability to apply for additional opportunities the communication breakdown may be solved. 7. Use best methods of communication. Each of your staff members may prefer a different form of contact method. Allow employees to setup their own communication method preference; either email and/or SMS so each candidate receives the type of communication that works best for their lifestyle. It shows each employee that you respect their requests and are able to comply. 8. Track staff performance for future positions. After each completed assignment, track staff performance. By analyzing past performance you can better understand how your workforce will handle future projects. Are you thinking about an integrated solution to streamline your workforce management? Consider all of the features offered with NextCrew and contact us today for more information!